"Booth after booth of gifts, original art, crafts and more!!! If you like handcrafted, vintage, original art, or unique, small businesses...we have it!!! Free bounce house for the kids. First 50 shoppers through the door each day will receive a 'swag bag' and one lucky shopper will win the 'Super Swag Bag'!!!" Admission is just $5 per person or $3 per person and 2 cans of food for the Golden Food Pantry; kids 12 & under are free w/paid adult. "AprilFest is fun for the entire family! Join us Saturday April 16th, from 9am-2pm. We will have many vendors, business booths, food trucks, a silent auction, and door prizes! There will also be a GIANT outdoor yard sale. " This fee includes 2 chairs. Table upon request for vendor booths. Electricity available, but space is limited. Applications are available here and are due by April 10, 2016. For more information, visit their website or contact their event coordinator at mreed@christchurchfw.com / 817-292-9292. "The City of Lewisville will help North Texans shake off their winter blues and brighten their spirits with its first ColorPalooza festival. The theme of the event is “A Celebration of Spring.” The outdoor festival will feature a wide variety of exhibits and interactive events with a “spring feel” for the whole family. Festival admission will be free, although some activities might carry a nominal charge. Visitors will get to show off their artistic abilities, watch skilled artists create one-of-a kind sculptures and paintings and more, purchase various arts and crafts from local artisans, and learn how to better care for the Earth and make their homes more environmentally friendly. There also will be emphasis on interactive events for children, including inflatable play structures and creative arts and crafts stations. Food trucks and vendors will be part of the event featuring all kinds of food choices including some with vegan and organic menus. There also will be a combination of strolling musicians and bands playing on the stage at Wayne Ferguson Plaza. Visitors will be entertained by a number of cultural music and dance groups. Free Parking." Applications are available here and are due by March 04, 2016. For more information, visit their website or contact their event coordinator at mjames@cityoflewisville.com. "Texas Birth Networks proudly presents the Birth Roundup. Birth professionals, advocates and consumers are encouraged to join us in welcoming special guests Ricki Lake & Abby Epstein for a weekend event in North Texas. This advocacy powerhouse is best known for their widely hailed, award-winning documentary “The Business of Being Born,” which they co-produced and Epsetin directed. The film inspired their collaboration in writing Your Best Birth and led to an array of equally empowering films such as a four-part follow up entitled “More Business of Being Born,” “Breastmilk,” and the newly released “The Mama Sherpas.” Currently they are in production for two new films: “Weed the People” and “Sweetening the Pill.” The Birth Roundup will feature a sponsor dinner, book signing and speaking engagement with a free Moms & Babies Fair." Booths are 6' tables for $100. Electricity is $15. For more information, visit their website or contact their event coordinator at admin@birthtexas.org. Applications are available here and are due by February 10th, 2016. 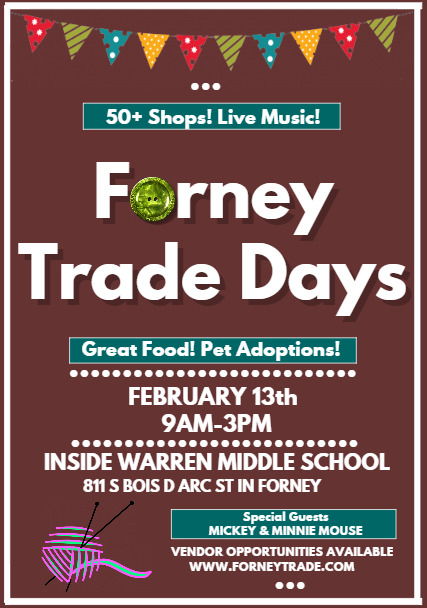 For more information, visit their website or contact their event coordinator at info@forneytrade.com / 469-412-0144. Booths are $60. A 6 FT. Table will be provided along with 2 chairs. This fee includes your business info in gift bags for every guest. Applications are available here and are due by January 29, 2016. For more information, check out their Facebook Page or contact their event coordinator at womenofabundantwealth@yahoo.com / 214-253-1696. "The iLIVE Expo is the largest wellness and empowerment expo for women and girls in the Dallas/Ft. Worth area; with a variety of speakers, authors, seminars, vendors, music and, empowerment. The iLIVE Expo will target girls and women, and will draw attendees in the Dallas Ft. Worth area for all ages. The iLIVE Expo brings together local and national companies that specialize in health and wellness, as well as increasing financial and entrepreneurial awareness by promoting a day full of informative lectures on a variety of wellness topics and interactive events for women of all ages. You’ll come away empowered to make the best choices for your life. The iLIVE Expo Objective: is to inspire and empower girls and women to embrace an empowered life of healthy living in every area of their life." Booths are 10x10 and cost $225, but they are running an Early Bird Special at $185. This fee includes small signage, 2 chairs, and 1 table. This fee does NOT include lunch or electric, this can be purchased at an additional cost. Applications are available here and are due by July 1 2016. For more information, visit their website or contact their event coordinator at info@iliveexpo.com. "On April 16 & 17, APRIL IN EDOM kicks off it's 12th Year. The Ole Fashion Street Fair is a weekend of fun and entertainment for the whole family with 75+ Crafters selling handmade and unique items, interactive kids area, festival food, pet parades/contests, a 5K Run, Cruise Night, plus 50 Performers/Songwriters on 2 stages. The Event is "Pet Friendly" so don't leave your 4-legged friends at home. Step back in time and join us!" Applications are available here and are due by January 31, 2016 February 15th, 2016. For more information, visit their website, facebook, or contact their event coordinator at vendor@AprilinEdom.net / 844-633-6689 844-6EdomTx Ext 3.